For pretty much as long as I’ve sailed I’ve had a fascination with the futuristic looking C Class cats, and their wing sails. I’ve always wanted to do a wing, but had imagined it would be as part of a C Class team one day. But what about building a nice scale version to get to know about them that bit better? Good plan – unless your own boat is already one of the most extreme sailing boats out there.... Oh well, got to be a bit bold sometimes. I’ve got a whole bunch of cool stuff in my little black book of design ideas, and was getting frustrated at seeing other people do things that I’d been pondering long ago. Rigs had received much thought, regarding what the next step might be. Rigging configs, wing masts and a variety of things have been sketched, but a wing was always at the end of the list as an end game solution. So why not give it a go, and miss out those intermediate steps? I knew there was interest in doing wings in USA, Switzerland, and Australia, so the race was on – who would be the first to do one? A covert race began, wondering each day if you would just go online to see somebody else had got there first. Bora and I joked at the Worlds that the code word for completion of a wing should be ‘The Eagle has landed’ A simple skype status update would be understood to mean only one thing. The wing had long been discussed with regard to the Moth, and I’d always thought you couldn’t do it, we capsize the boat just to launch – a wing wouldn’t like that. It would probably be heavier, and sailing a heavy rigged Moth would not be that nice in terms of handling. But what if it did work? I'd been considering it for ages, and my weighs spreadsheet kept me honest for a while, until I simplified it enough, and had gone into some depth with thinking about the structure. It is an interesting problem, because the design and structure are so linked. Post launch, I’d say I worried about the weight too much. 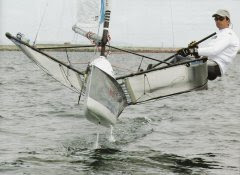 Launching and capsize recovery was easy enough, and the effect in tacks and gybes wasn’t noticeable. The added weight up high is probably a performance gain upwind for those of us with less righting moment anyway! Design wise it is a very simple two element wing, with camber and rear element twist control (although I probably went too far in making it capsize safe, and the rear element is quite stiff!). Being quite weight conscious I played safe on the sizing, going a bit under area. Slightly less span because I was concerned over the cg height, and slightly smaller on chord because I wanted to fit it onto a standard Mach 2 Moth, and the mainsheet location imposed a few size restrictions on me. I could have done a transom mainsheet system like some use, but having used that system and capsized on the first tack, I thought it was a little punchy given how little sailing time I had available to me. It was never intended to be a fully finished product straight away. Most people thought it couldn’t be done on a Moth, (or at least was a stupid idea! ), so this was a little step into the unknown slightly. Rules wise many people have been in touch about how you measure it. We have an ISAF sail measurement document that describes the procedure for wing sails, and I’ve chatted to the C Class guys about how they measure theirs. The Moth class measurement manual is being updated to include these documents. Ultimately whether something like this remains within the class is up to the class, as we have a philosophy of retrospective legislation. I’m not fussed either way, somebody was going to do it one day, so I just fancied being the first. It is a cool project I wanted to do, and has been worth every penny already. Performance. A question a lot of people have been asking is how was the performance? Well I was only out for 30 mins, and that was really more of a structural test than anything else! Would it destroy itself in a shower of carbon splinters? Could you launch it? Would it survive a capsize? 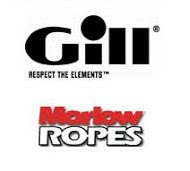 These where the more pressing points in my mind, but there was another boat out, and there is something in all Moth sailors – a pressing need to buzz the tower Top Gun style! It was Simon Hiscocks out in his 49er (new rig). I lined up with him briefly downwind. I was faster, and at times was lower as well, but this was still inside the first 5mins from launch, and I was still playing with camber settings, and getting to grips with the fine line of wing trimming downwind at 19 knots. When I was in the groove, I was faster and lower at times, but occasionally I’d stall it, and have to head up to re-attach. VMG wise, about the same as my normal rig I’d say, but with plenty of potential to go better with a bit more time. Upwind was a nice case of higher and faster. I’ve lined up against most of the GBR 49er squad, and have generally had an edge, but this felt like a fair bit more... Hard to judge though for sure, so we’ll see next week when I get to go up against some other Moths. Data logging with my PI Garda box starts on the next sail as well. Many people have asked about how practical it is – well it is obviously not as practical as a standard rig, but this one fits on my current road trailer, and I plan to make the top section above the hounds come off after the Euros, and then it will pack into a box about the size of our current Moth travel boxes, so that then isn’t too bad. Cost? – I had the initial mould costs, but if you forget that, the wing probably cost me only a little more than going out and getting a new mast, boom and sail together. Having done one – the time to build another would be a lot less. Interestingly a home builder could buy the component bits and get a rig for cheaper than currently. With less than a weeks sailing time before I head off to the Euros – it is unfortunately my standard championship preparation again! But faced with the choice of sailing around just outside the top bunch regretting not doing enough sailing, or go radical and put up the wing – it was an easy call, the wing is going. Chatting to Nathan the other day – he’s done almost as much sailing in one month as I’ve done in my Mach 2 in total! Ironically a good reason for me to do it was the lack of time I had. I was set up for another season of minimal training time in my boat due to coaching commitments. My schedule only got more hectic with TeamOrigin work as well, and I saw a careful build and sailing timeline get smaller and smaller! But the project lent itself well to me designing it, and having it going as a project in the background whilst busy with other things. 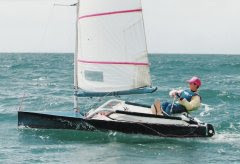 The most work is in the thinking time on a project like this, and I had thinking time – whether it be in the evenings at events, or on a plane travelling to and from a variety of events around the globe, but I didn’t have sailing time available to me until much later in the year, so it fitted in well. As a final note: I nearly started with this, but as there are a number of non-mothies reading this I’ll finish with it instead. I’ve been suffering from Babbageitis for a long time. In Dubai, Scott admitted that he often thought about what he would write in his next blog post while sailing along. Well I’ve had a bad dose of it as I’ve been pondering my possible blog posts on the wing far too much! Thank you for all the nice messages about this. I’ll post more details soon, but I’ve got a busy week with TeamOrigin in Cowes, so I’d better focus on that. The ribs following me, all predicted I'd play safe, and tack round on the first sail. It felt fine so I rolled straight into a foiling gybe - that got a few cheers! Thanks for shareing all this with us. Congratulations on a great achievement. The Moth class has now taken another big step into the future. Congratulations on a fantastic achievement... Forget the 49er, when are you going to challenge Larry to bring BOR90 for short course racing at Foiltown???? Major thumbs up and thanks for the nice blog posts also. Fantastic achievement. We'd talked about it in Weymouth but I'd not realised how close you were to doing it! Awesome! I hope you stick with it and drag others in the wing direction! Keep spreading the word. When we're back from Newport we defo have to line-up Invictus against your machine again... Wing against wing. That would be a cool sight! Good luck for your race. I thought for quite a while about what would be the next big step in moth development, but wing masts always seemed hardly possible! 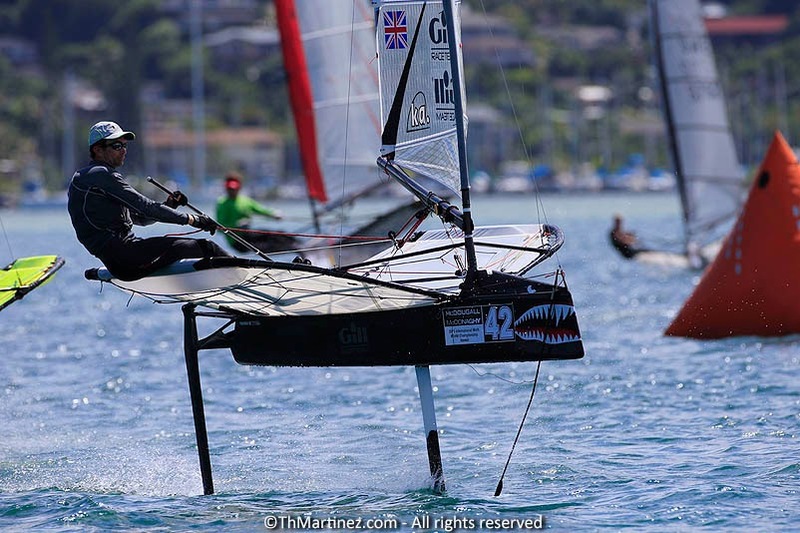 As a former multihull racer I am amazed by the Moth on foils and a wing sail. WOW! This is way better than a Flying Dutchman on a plane. Good work and photos. I'm creating a wingsail in Brazil to my trimaran the "Flower Power" a 26ft boat.